We hear you New York! You love classic comedies with our live soundtracks. You've been jam-packing every one of the Silent Film Spectaculars at Jalopy Theatre with smiles and laughter, and you've asked for more. So this week Thursday, April 19th, catch a new installment of classic comedy two-reelers with our original jazzy score. Click here to purchase a $10 ticket on Jalopy's website. 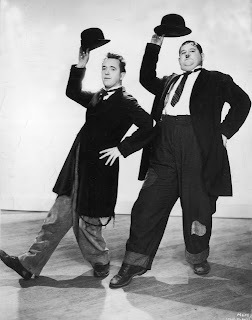 We had such a hoot with Laurel & Hardy's "Big Business," that we've paired with them again on "Liberty" (1929). While on the lam, the duo get their pants mismatched and, in an effort to get properly dressed, wind up dangling high above the city. 'Nuff said. "Fiddlesticks" (1927) is our first collaboration with Harry Langdon, and a very promising start. Harry wants nothing more than to be a successful musician, but finds in this film that resourcefulness is more important than any music degree can confer. So true! We're happy to have Lloyd Miller from the Deedle Deedle Dees joining us for this show and playing Harry's actual bass part! For our third film, we are bringing back one of our favorites, Buster Keaton's "The Playhouse" (1921), which we premiered at our first Spectacular, a year ago. We've seen a lot of silent comedies, and there is not a single one quite like this film. 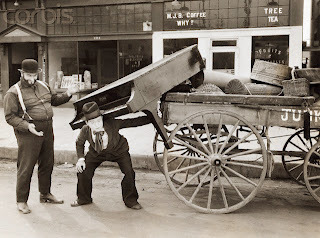 In an age where film technology was rather limited, Buster was able to achieve a number of astounding effects here, AND deliver all the comedy that made him a star. As always, this show is suitable for all ages, and each film is only 20 minutes long, so you'll be able to dip into Jalopy's fine selection of beverages during the breaks, and the evening will conclude with us performing a short set of original tunes and standards. These shows always sell-out, so get your ticket now! Still ONLY $10! Click here to purchase a ticket on Jalopy Theatre's website. Critics' Pick of the Week, hey hey! Did you see us on Four Weddings? Halloween Live Music-Silent Film Spooktacular!